Today we will consider TruePlay - a B2B platform with a set of software solutions for online gambling business, which provides licensed gambling companies with access to the software (Software-as-a-service). TruePlay seek to develop online gambling and make it as legal and transparent as possible from any point of view. Through using platform, players will be 100% sure that it’s impossible to manipulate the result of the game. Statistics will make it clear that games are in line with world standards and are not set for a user to lose. Game operators and developers will receive a decentralized structure for their game content around the world and protection from copying the brand and games. Gamingtec company is developing the first pilot project - Fairplay, which is completely based on TruePlay technology. The company has received a license to organize gambling in the Kahnawake Gaming Commission. TruePlay provides Gamingtec services under software license agreement and technical support services. Thus TruePlay is not a gaming provider but a platform with its own method of software solutions for online games, where software can only be accessed by licensed gaming companies. 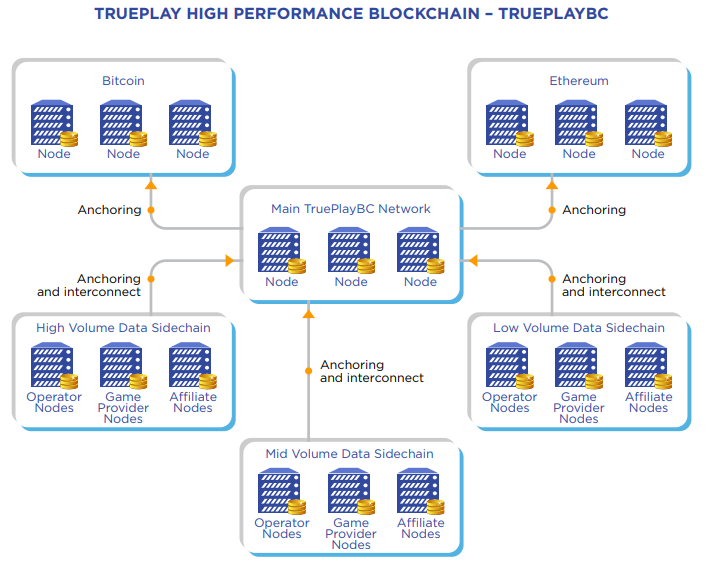 The whitepaper of the projects says that TruePlay uses intelligent contacts which ensure full transparency, security, and protection of gaming sites in case of hacking attacks. Protection provides by a proven standard AES-256 and SSL at the network level Information. Also the system uses its own game currency - TPLAY. In accordance with the laws of many countries, gaming portals are prohibited from using traditional money, so the use of cryptocurrency will expand the audience of users. Now there is no need to pay for the integration of the game into your project, this feature will be available absolutely free. The main feature of the platform is its honesty control, based on blockchain technology which therefore gives a 100% guarantee that the results of the games will not be rigged. The constancy of the data in the blockchain will not allow somebody to juggle the results of the game, and the impossibility of reverse transformation of the cryptographic hash of the series guarantees the security of the platform. TruePlay is a copyright holder of the software and will charge a license fee, transaction fees and other types of fees that will be set individually for each platform connected to project. The project is planned as follows: 60% for token sale, 20% being reserve for the team, 19% for TruePlay reserve (not specified for what), 1% for bounty campaign. Soft cap is 3,000 ETH, hard cap is 43,000 ETH. Taking into account the fact that the project has started the private sale stage in April 2018 and still hasn’t moved on, it’s clear that token sale is not going smoothly. It is worth noting that the level of competition in the area in which the project operates is extremely high. There are a lot of similar casino platforms (for example, Slots4play) and according to the website of the project and its moderate social and marketing activity there is no single argument to mark TruePlay. Such platforms also have to deal with the emergence of prediction markets such as Amoveo and Augur. These are markets where almost anything can be put up on bet, and they are growing in popularity fast. Everything mentioned above cause concerns, because even with a working prototype (the project has already developed the platform core MVP that can’t be seen anywhere), as well as with a number of partnerships, the project doesn’t look special or interesting from the investors point of view. Click here to visit TruePlay page in the list of our ongoing ICOs.